Through her business, Raw Bay Area, Heather offers raw food coaching, classes and special events to inspire and educate people about the power of raw food. Heather Haxo Phillips is an accomplished raw vegan chef based in the San Francisco Bay Area. 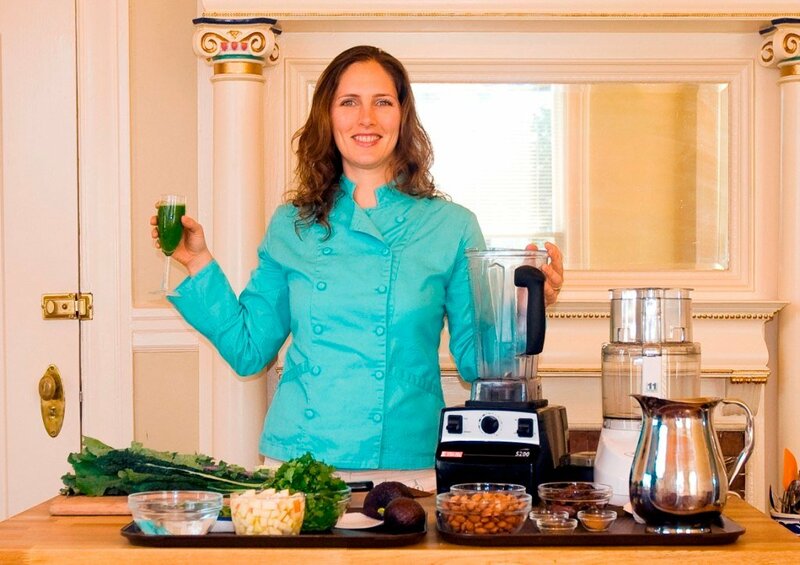 Heather is a certified raw food chef/instructor and graduate of the Living Light Culinary Arts Institute. Her holistic approach to food and well-being makes Heather a very popular speaker for participants at all skill levels. Students say Heather’s classes are informative, extremely well-presented, easy to follow and fun! Heather also is a certified Iyengar Yoga instructor. You can find out more about Chef Heather at http://www.rawbayarea.com/. When I was 16, one of my teachers asked me if I wanted to run one of the clubs in our high school. It was the National Organization for Women, which turned out to be the first N.O.W. chapter in the country. This decision set me on career path, I spent the next 15 years working on community organizing projects related to women’s health and empowerment. It absolutely prepared me for the work I do today. My husband told me to pursue my dream, which meant quitting my day job and creating a business that made me and others happy. I did that nearly 5 years ago and Raw Bay Area was born. Without his advice and support, I never would have had the courage to start my own business. But, it seems that I was born for this kind of entrepreneurial work. The world around me feels more beautiful because I am working at a pace that feels sustainable, on projects I love, with people I adore while improving others’ quality of life. It is very fulfilling. Exactly what I am doing now. I love it! In sirsasana, standing on my head. Drink green smoothies – a quart every day! That will boost your energy and vitality. Also, find peace in your heart. We all have to look for peace – it doesn't come naturally. To start, surround yourself with people and activities that will help you cultivate inner peace. Feeling good about who you are, and where you are, will allow you to weather all the storms that naturally come our way. Isn't she beautiful? If you want to keep up with Heather's amazing life, follow her at rawbayarea.com!